We were asked to rebuild a client's existing AMD based box. The motherboard was an Asus A8N32-SLI board with a 2GHz AMD part on it. Once we started the Vista setup, the first thing that was readily apparent was the very long time the setup was taking to get to the initial install screen. Prior to this setup attempt we had imaged and wiped the drive on our newly restored data mule system. No physical errors showed themselves during these pretty intensive operations. When searching the Internet, we only came up with one result on the Asus Forums: Topic : [Problem]Vista 64 install fails during HD partitioning. The response was to verify that the motherboard did not have RAID mode enabled for the single drive setup. When we rebooted the system and headed into the BIOS, we eventually found the setting for the SATA controller and it was indeed set to RAID mode. After making the necessary changes in the BIOS, we again booted into the Windows Vista setup. This time, the initial setup phase still took quite a while though not as long as the previous attempt. 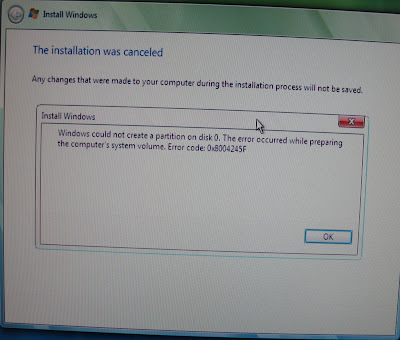 Once we went through the setup steps and chose our partition to install to things continued on as expected. Thanks to Ventsislav on the Asus Forum for the tip. I meant MB instead of HD. Watch out for those search results! Wildcard Certificates - Your recommendations?